The Q-Team was developed with our Customer Panel, as another way to check our services and find ways to improve them. 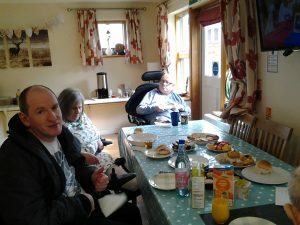 The team is trained to go out to our services and spend time with other customers, asking about the support they get, their homes and what their goals are in life. We pass on the answers they collect, together with their comments and recommendations, to our Team Leaders. Our Team Leaders use them to create service improvement action plans. We don’t have a checklist of what makes a good service. The Q-Team is all about creating opportunities for customers to talk about their lives. Alongside our CQC checks and internal audits, this helps to create a full picture of the quality of our services and gives us valuable feedback. Customers are positive about it too.